I’m a self tought artist, actually a part-time self tought artist. I mainly draw and the first assignment I felt in love with was drawing imaginary creature when I met Carla Sonheim online through world-wide web. For the last 5 years I’m learning and improving my creative skills in in-person classes and in online classes on the internet and in self studies. On my blog I like to share some part of my process online. I have to say ‚some part’ because sometimes I ran out on time and a recent post has lost its sense. 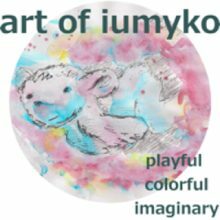 My name, well, I shortened my real name into the acronym iumyko – iu for JU-tta, my for MUE-ller and ko for KO-eln, my hometown.